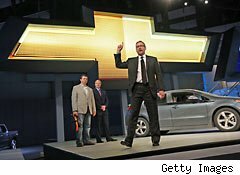 There's one thing about General Motors (GM) CEO Dan Akerson: He doesn't shy away from a fight. Called before a congressional committee on Wednesday to testify about a safety investigation into the Chevrolet Volt, Akerson was blunt. The political hullaballoo around the car cast "an undeserving, damaging light on a promising new technology," said Akerson, who drove to the hearing in a Volt. "We did not engineer the car to become a political punching bag." Tough words. But then, rescuing the high-tech Chevy's reputation is going to be a tough fight. This all started back in June, when a wrecked Chevy Volt -- a car that had been totaled in a government crash test three weeks earlier and left to sit in a lot -- caught fire, all by itself. The Volt, of course, is a hybrid, but an unusual one. Essentially, it's an electric-powered car with a gas-powered on-board generator. It uses a lithium-ion battery pack, a newer kind of battery than those used in most hybrid cars. The fire raised questions about the safety of the new battery technology. After the fire, the National Highway Traffic Safety Administration -- the federal agency that conducts crash testing -- notified GM, which sent engineers to examine the car. Attempting to replicate the fire, GM and NHTSA engineers conducted a bunch of experiments, including one where they mounted a Volt battery pack in a wooden frame and smashed it in a particular way. A few days later, it too caught fire. Clearly, GM needed to take action. GM accelerated its efforts to educate first responders and body shops on ways to reduce post-accident fire risks. (The key is to drain the batteries, just as you'd drain the gas tank of a crashed car before working on it.) It put production of new Volts on hold and later offered to buy back cars from any customers who were concerned. And the company started designing a fix: extra protection for the battery pack that could be retrofitted into existing Volts. But it wasn't until November, six months after the initial fire -- and only after Bloomberg got hold of the story -- that NHTSA opened a safety investigation and notified the public. That time lag has turned out to be a problem. If the Volt were just another car and GM just another company, this whole thing would probably be no big deal. NHTSA gets 40,000 reports of vehicle safety problems every year. Only a few of those turn out to be serious enough to lead to action by the agency, and most of the time, those actions are routine: The manufacturer comes up with a fix, issues a recall, and updates the affected cars. All auto manufacturers, from Ford to Ferrari, have recalls every now and then. As long as nobody's injured, they're no big deal, and they get handled in the ordinary course of business. But the Volt's no ordinary car. It really is a high-tech masterpiece, a great example of American ingenuity -- and a pretty nice car to boot. But it cost a fortune to develop, and some of that was funded by government loans and grants. GM has tried to make the Volt a symbol of its renaissance, but in some minds, it has become a symbol of the still-unpopular auto industry bailouts instead. House Republicans and pundits have made a lot of hay out of the issues around the Volt, even going so far as to suggest that the Obama administration covered up a potential safety defect to protect its ownership stake in GM, a relic of those 2009 auto bailouts. That's probably not true. And it's largely moot at this point. Last week, NHTSA gave the Volt (with GM's fixes incorporated) a clean bill of health, closing its investigation. GM will start installing those fixes in customers' cars in a few weeks and will resume production of the Volt next month. But the task of fixing its car's reputation will take a lot longer. Akerson's appearance before Congress coincided with the launch of a new GM marketing campaign that touts the Volt's efficiency and safety. But given the concerns surrounding the Volt, and an election-fueled debate about whether government should help promote green-car development, the Volt's tenure as a political punching bag may not be ending any time soon.